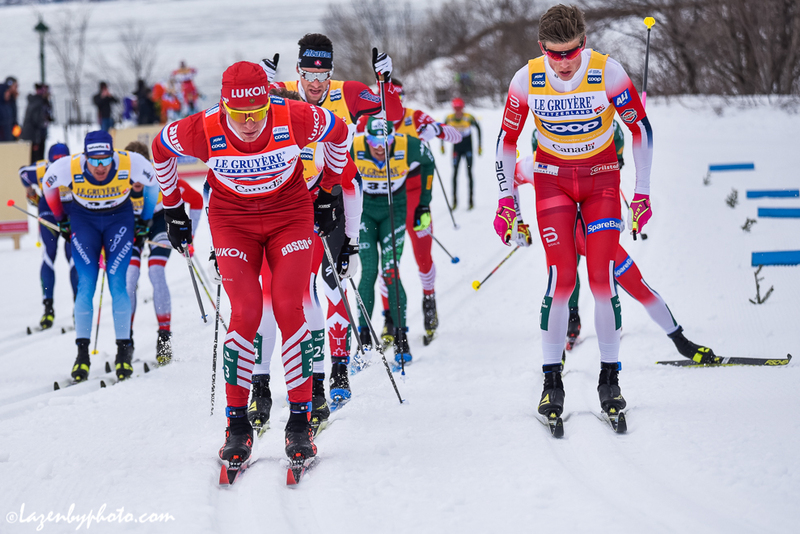 Amidst overcast skies and spectators bearing signs for the local cross-country favorite, Canadian Alex Harvey, World Cup Finals resumed on Saturday in Québec City, Québec with a men’s 15-kilometer classic mass start race. 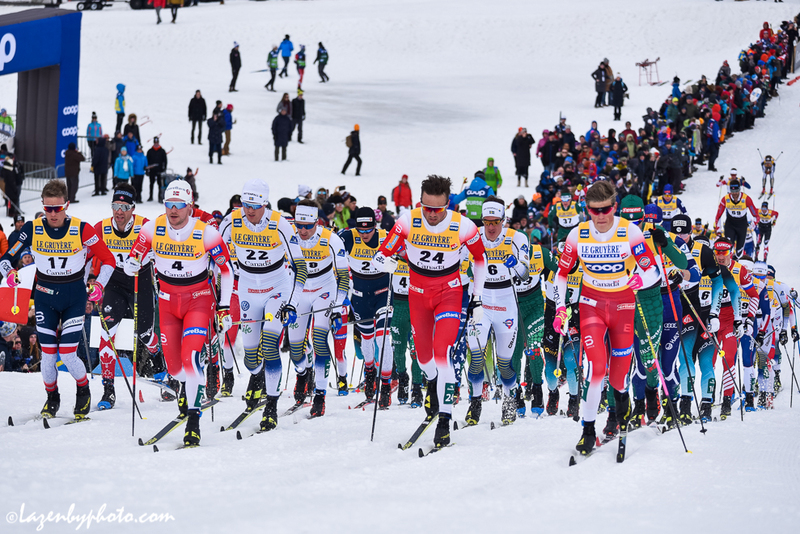 Thanks to his win in Friday’s freestyle sprint, Norway’s Johannes Høsflot Klæbo lead Saturday’s 78 starters out of the gate, his yellow bib also indicative of his first place rank in the 2019 Overall World Cup Standings. With Saturday and Sunday being the last competition days of the World Cup season, and only 24 points separating Klæbo’s first place (1443 points) from second place Alexander Bolshunov of Russia (1419 points) in the Overall Standings heading into the 15 k on Saturday, both athletes were looking for a win. Klæbo to solidify his position on top and Bolshunov to supersede it. Leading up to 10 k, it appeared as if Bolshunov was on track to overhaul Klæbo’s immutable position on top. The Russian had positioned himself at the front of the lead pack’s 13 skiers which included Klæbo, Harvey, Italians Federico Pellegrino and Francesco de Fabiani, Russian Andrey Larkov, Switzerland’s Dario Cologna and Norwegians Didrik Tønseth, Sindre Bjørnestad Skar, Emil Iversen, and Sjur Røthe. Taking charge through the climbs, Klæbo and Bolshunov went stride for stride, with Harvey hard pressed a little more than 1 second behind. “I didn’t want to be leading because it was windy but I wanted to be near the lead every time,” Harvey told FasterSkier after the race. Their descents through the tight sugary s-turns were maneuvered with ease. At 12 k, a Klæbo versus Bolshunov battle had directed most of the race and seemed fated to the finish. However at the 13 k mark, halfway up one of the course’s major climbs, the bottom of Bolshunov’s right pole snapped. Although he received a replacement pole within a meter or so, the broken one did damage to his pace. With Tønseth pushing the pace, Bolshunov began to fall back. By the bottom of the next descent, the lead group had dwindled to five: Tønseth, Klæbo, de Fabiani, Røthe, and Harvey. “We started to stretch the pack and…Didrik [Tønseth] is the strong guy that can make a hard drive in the final 2 kilometer to the finish he’s better than Johannes [Klæbo] or me in that so it was almost fun for him, if you want to be on the podium you got to punch it hard now and I knew for me it was going to help me,” Harvey said. For the remaining 2 k, all five skied together until the finishing stretch. In the final 100-meters to the finish, Klæbo moved to the front and held off the charge of Harvey and Tønseth. Klæbo crossed first in a time of 36:10.9, while Harvey claimed second, just 0.8 seconds behind Klæbo, after a last minute surge past Tønseth. Crossing 0.5 seconds back from Harvey and 1.3 seconds back from his teammate, Klæbo, was Tønseth in third. 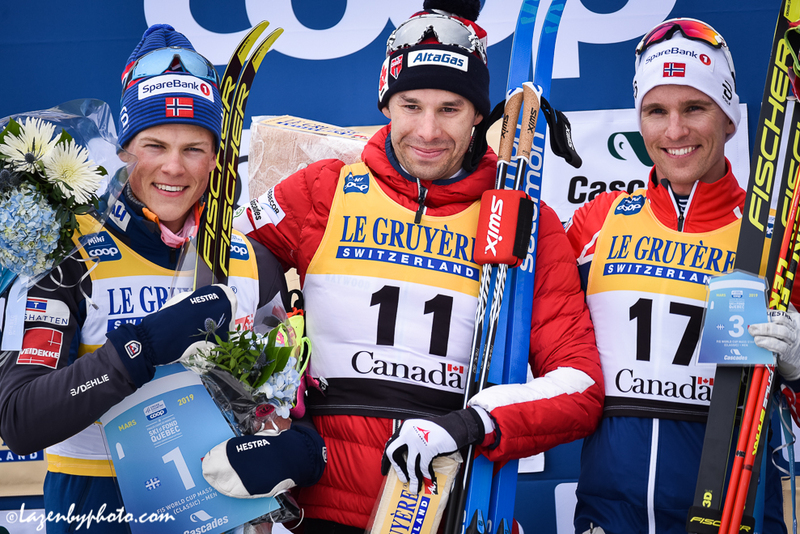 Two years ago, World Cup Finals were also held in Québec City with Harvey coming into that weekend ranked third in the Overall Standings and having just won his first individual World Championships gold in the Lahti 50 k.
Harvey confirmed earlier this season that World Cup Finals in Québec City will be the last World Cup races of his career. The Canadian will now start Sunday’s pursuit less than a second behind Klæbo. “I felt strong today so I was able to come up in the front again. I needed these points for the total World Cup,” Klæbo told FasterSkier after the race. With Saturday’s 15 k complete, Klæbo retained his top spot in the Overall Standings now with 1493 points. Bolshunov is currently second with 1451 points and Røthe third with 892 points. Following Harvey was the U.S. Ski Team’s (USST) Erik Bjornsen in 18th (+1:04.3). Around 4 k, Bjornsen was at the front of the 78 skiers who started the race. “The way my season’s been going it feels easy to go at race pace but when there are surges in the pack, if I try to go I just flood and I can’t really recover the way I’m hoping. But that was fun today,” Bjornsen said. The next top North American finisher was Canada’s Len Valjas in 32nd (+1:43.6). 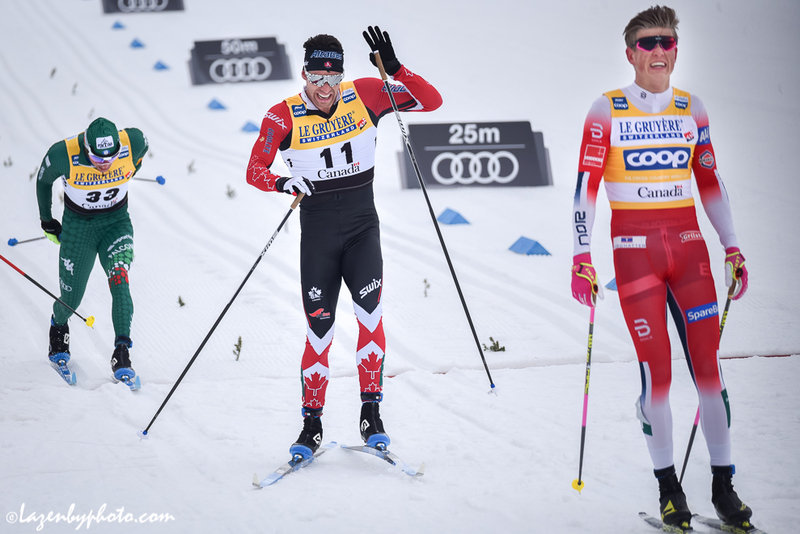 “I was in bib 69 and I was skiing with some guys who were in the Top 20, so it’s really exciting for me to feel sort of back again,” Valjas added. Following Valjas was the USST’s Simi Hamilton in 39th (+2:13.7). After the race, Hamilton indicated that prior to Saturday, his most recent classic distance race had been the Lillehammer 15 k back in December. Also skiing for the Americans was Kevin Bolger in 44th (+2:31.1), Scott Patterson in 50th (+2:37.9), Gus Schumacher in 56th (+3:44.1), David Norris 57th (+3:48.8), Ben Saxton 66th (+4:55.0), Logan Hanneman 67th (41:17.2) Ben Ogden 70th (+5:15.2) and Peter Holmes 73rd (+6:30.4). Andy Newell did not finish. For the Canadians Remi Drolet finished 52nd (+2:57.4), Evan Palmer-Charette 55th (+3:16.6), Philippe Boucher 58th (+3:53.9), Jack Carlyle 59th (+4:13.6), Russell Kennedy 62nd (+4:27.0), Antoine Cyr 63rd (+4:29.8), Scott James Hill 64th (+4:46.5), Alexis Dumas 65th (+4:52.3), Bob Thompson 69th (+5:06.6), Antoine Briand 71st (+5:16.1), Julian Smith 72nd (+5:56.7), Julien Locke 74th (+6:31.8), Graham Ritchie 75th (+6:44.4).